Ventfort Hall, Mansion and Gilded Age Museum, in Lenox. Celebrate Mother’s Day Weekend this year at our Berkshires Bed and Breakfast, and take mom to the Pre-Mother’s Day Pink Tea and Ballet at Ventfort Hall. The Pre-Mother’s Day Pink Tea and Ballet begins on Saturday, May 12, 2012, at 3:30 p.m. Entertainment is by the American Dance Insitute Ensemble, the Albany Berkshire Ballet Junior Company, and the Catarella School of Dance. A special pink tea and refreshments will be served after the ballet. 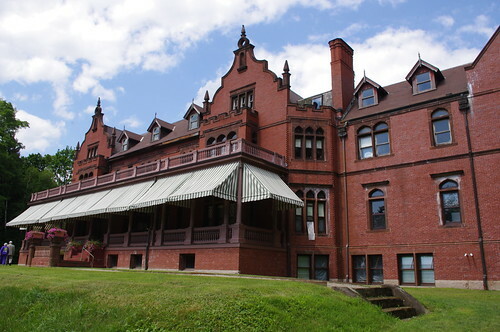 Ventfort Hall is a historic mansion and Gilded Age Museum in Lenox, Massachusetts, not far from our Berkshires Inn. Built in 1893 for Sarah Morgan (sister to J.P.), this Jacobean Revival-style mansion is being restored to its former glory. The first floor of Ventfort Hall is home to The Museum of the Gilded Age. As the name suggests, exhibits focus of the life and times of the Gilded Age, which lasted from the late 1860s to the end of the century. Currently on exhibit is “Les Petites Dames de Mode”, 59 exquisite miniature fashion models that portray the history of women’s fashion from 1855 to 1914. The ladies and their fabulous costumes were lovingly created by John R. Burbidge, who was Senior Designer for the famous bridal house, Priscilla of Boston prior to his retirement. This was a labor of love. Bring Mom–either your mother or the mother of your children–to our Bed and Breakfast Berkshires for Mother’s Day this year. Spend the weekend exploring the area, and enjoy a special Pre-Mother’s Day Pink Tea and Ballet at Ventfort Hall. Moms deserve to be treated well. Additional information is available at Ventfort Hall.